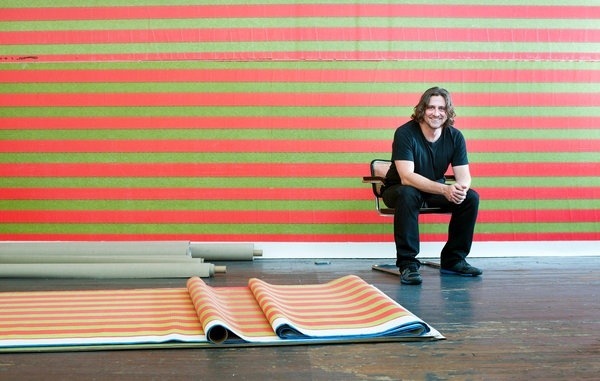 Wade Guyton is an artist currently filing the walls at the Whitney. His work is inkjet print computer creations on linen. The artist admittedly hates drawing and painting, and prefers computers and video games. The reviews of the show I found praise Guyton for his ingenuity and clever output. They claim it’s untraditional, implying somehow avant garde. Firstly the recycled culture bit – it’s simply an artist in 2013 echoing Andy Warhol’s fascination with the machine but without the amazing cult of personality and foresight. Unlike the reviewer, I feel Guyton’s work is still traditional painting! We used to paint what we worshipped – nature, saints, fantasy etc – we still paint what we worship, in this case computer screens and keyboards. There is nothing untraditional about it. It’s simply using poor materials – digital printer versus oil and brush. The artist’s intention is still there, and yes unlike the warmth of a brushstroke it’s clinical. Which is not far from how this generation approaches relationships. Art does imitate life. Carol Vogel of the NY Times writes: “Mr. Guyton is at the forefront of a generation that has been reconsidering both appropriation and abstract art through the 21st-century lens of technology.” This is a fancy way of saying Guyton, like the majority of artists these days, are recycling culture with no real vision except the tunnel of their computer screens. Recycled culture comes with many fancy PhD-sponsored terms. My favorite is “appropriation”. This is the most obvious on the front end – it simply means to copy. But thanks to professional art theorists “the way” and “the what” that you copy has enormously complex ramifications. In the old days (say 100 or so years ago), copying another artist’s painting was a way to learn, and copies were even sold as they showed the copier’s bravado. Now copying is shameful, unless of course it’s under the guise of appropriation. To copy in the music arena is simply sampling. There are some critics who advise people to steal or copy, especially in the music and technology realm – it’s part of creative license. After all, everything HAS been done before, people simply weren’t listening/seeing the first time around. Another fun recycled culture term is “social practice”. This is a term artists declare as their medium – “Do you paint?” “No, I do Social Practice”. OK, firstly this seems redundant to living, and secondly it’s simply a term referring to Happenings or Performance Art which had their official beginnings in the 60’s. Or if you include “social practice’s” parody of corporations and the like, well critiques and parodies of institutions are as old as the corporations they are critiquing. For example one of the first forms of institutional critque came when the Salon des Refusés became popular in the 1860s. While the first exhibit of “rejected art” was government-sponsored, the subsequent were not and happened completely outside the Salon and eventually diluted the power of the original Salon. Kind of like Fluxus and its anti-art stance washing out the core of craft in art. In sum, there will always be a few streams of art that flow throughout time, streams that flow, not recycle. The desire to create new buckets of art with fancy names will continue to be inspired by heavily schooled art theorists with publishing requirements. The streams that flow are different than recycled culture. The streams that flow are like new varieties of tomatoes, recycled art is like ketchup. Meanwhile, realize what you are seeing (or hearing or watching) is what you are getting, and know that the work doesn’t necessarily move you because it’s not new or deep for that matter. Just because someone has a mid-career retrospective at the Whitney does not mean you should drop your brushes and heed the call to inkjet print. There seems to be indecision even amongst the cultural leadership about what’s the “new new”. Realize that even if you are doing traditional photography or traditional painting this just may be the most radical thing to do right now.